Wide Awake Hearts lets us swim around the entangled love affairs of a set of four attractive people making a movie. L-R Tony Naumovski (C), Ben Cole (A), and Clea Alsip (B). Photo Carol Rosegg. We’re in the affluent home of a hip movie writer, A, and his actress wife, B, who’ll star in his next movie. All characters are named with the first letters of the alphabet in order of appearance. Why? Perhaps because in pairing off as lovers, they mix and match as readily as letters make words. The entry of another man, C, and, eventually, another woman, D, into their living room cause recrimination, anger revelation, and a lot of screaming, something like Who’s Afraid Of Virginia Wolfe, although the characterizations are less rich than in Albee’s play. C, a bullish guy with an alluring Slavic manner, and the writer’s good friend, is the trouble maker. An actor who comes from somewhere else, he’s going to be in the film so the writer invites him to stay with him and his wife. Why? We know from the start that C is a wolf in wolf’s clothing – why can’t the writer see it? We learn fast that C has, in fact, been the wife’s lover for as long as they’ve all known one another, and they waste no time when the writer leaves to make passionate love, although the director keeps it visually non-transgressive. It’s transgressive enough, though, for the writer to become wretched and ironic when he walks in on them. This confrontation triggers a lot of swilling red wine around in glasses, predictable comments and, as mentioned, screaming. The arrival of the film editor, D, who is C’s more-loving-than-loved lover, generates a fresh onslaught of agonizing. The dialog is not the strength of this play, although the monologs, and the acting, are fine. Maren Bush as D and Ben Cole as A. Photo Carol Rosegg. About midway through the play (90 minutes, no intermission), the Slavic actor kneels center on a dark stage facing the audience with the spotlight upon him and delivers a long speech to God, boldly listing his extensive sins: I found this really intriguing for being so comprehensive – one man did all that. All the characters are flawed in characteristically human ways, but C is the snake in the garden. And like the Devil in Shaw’s Man and Superman, C gets the best lines – his monolog is richly articulate, varied in language and rhythm, and in all ways more effective than the flat dialog (“I love you.” “I love you sometimes.” “Do you love me?” “No.”). While C’s monolog is particularly dramatic, each of the characters has his or her own compelling monolog, all much stronger than what passes in between. The farther the play advances, the less sure we become of what, if anything, is “reallife” and what is the movie being filmed. Did C “really” get on his knees and have that, ultimately disappointing, communication with God or were the cameras whirling? Among A, B, C and D, who finally comes to love whom is, as one of them says, “predictable,” in fact trivial, so for narrative interest, we’re left to puzzle over what’s real life and what’s film making, though no particular insight is brought to this age-old play of ambiguities. Ben Cole as the film writer is engaging in his initial monolog, humorous and appropriately ironic throughout without making irony a cliché. Clea Aslip as the flighty wife has terrific timing and subtle expressive nuance in her voice. Tony Naumovski acts the seductive Slavic brute as a type but finds depth in his remarkable monolog and anyhow, he’s just fun to watch. Maren Bush is crisp and yet touchingly vulnerable as the film editor. 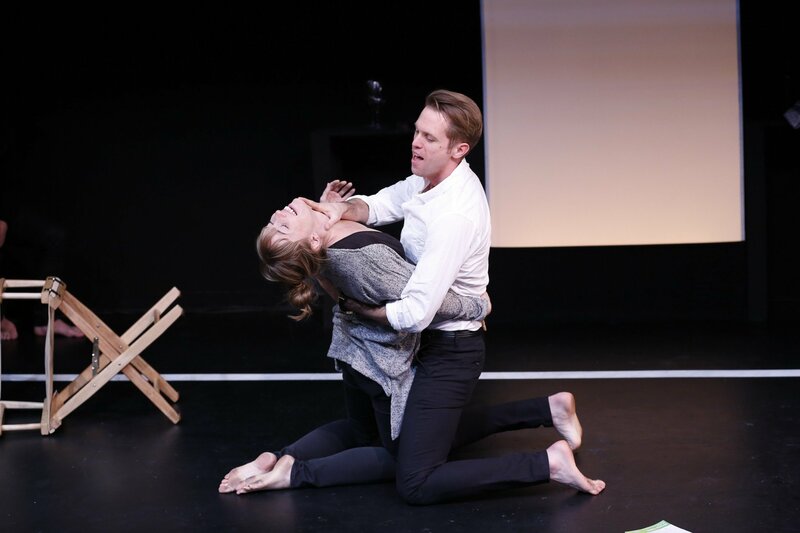 Produced by Birdland Theatre, Wide Awake Hearts plays at 59E59 Theaters in mid-town Manhattan through February 7, 2016. For more information and tickets, click here. Great review. Wide Awake Hearts is modern and visually stunning. Great directing and acting! Go see it. You really have seen much more in this production than I did. I did find it somewhat turgid and had trouble with “C’s” long confessional. The acting was excellent.